Movers & Shakers is brought to you by the Senior Housing News Job Board. 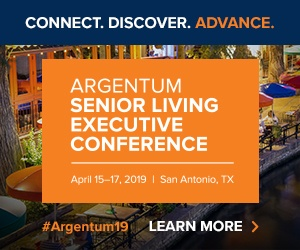 Browse and apply to management and executive senior living jobs and positions from leading professional firms serving the industry. Employers can post single jobs, purchase job packages or our premium subscription that includes unlimited job posts and editorial coverage for one year. Visit SHN Jobs today. Watercrest Senior Living Group has welcomed Andrew Gall into a new role as executive director of Market Street Memory Care Residence, a 64-unit memory care community in Palm Coast, Florida. In his day-to-day work, Gall relies on communication and problem-solving strategies, and will help motivate and train the community’s associates. The Palm Coast property has a central “outdoor” streetscape plaza with a newsstand, art gallery, bakery, salon and spa, and post office. Leslie Hyland was chosen as the executive director of Heritage Muskego, a soon-to-open senior living community in Muskego, Wisconsin. Hyland, who has more than 15 years of experience in the senior living industry, is not a newcomer to Heritage. She has been with the company since 2017, previously working as the executive director of Aspire Senior Living, a Heritage property in Kimberly, Wisconsin. Heritage Muskego will come with 108 units and a technology suite that includes wall-mounted screens in the hallways to track and monitor patient care and a medication management system. Sweetbay Senior Living has named Kimberly Migliozzi as the executive director of the Residence at Whitehall, a 127-unit senior living community set to open in Pittsburgh later this fall. Migliozzi has spent time in the fields of patient care and senior living administration, most recently working as executive director at Arrowood At Southwestern in West Mifflin, Pennsylvania. The Residence at Whitehall is scheduled to open in November, and is currently pre-leasing. Integral Senior Living has made personnel announcements at two of the communities it manages. The Pointe at Lifespring Senior Living, a senior living community managed by Integral Senior Living in Knoxville, Tennessee, has promoted Madison Wright to the role of senior Vibrant Life director. In her new role, Wright will be tasked with providing an activities program for the community’s residents and as assisting other Vibrant Life directors in policy and program implementation. Wright first joined Integral Senior Living as a sales and marketing assistant in 2016. Additionally, Amara Place Senior Living, an Integral Senior Living community in Columbia, South Carolina, appointed Melisa Bond as its new director of sales and marketing. Previously, Bond worked as a senior lifestyle counselor for Discovery Senior Living, where she helped seniors and their families in choosing a senior living community. Berkadia has named Bianca Andujo as the new senior director of its senior housing and health care group. Andujo now reports to Senior Managing Director Heidi Brunet, and will work out of Dallas. Previously, she worked with Bank of Texas as senior vice president and health care banking. In that role, she oversaw a team of seven and a total portfolio of $450 million, with a primary focus on skilled nursing facilities in the Northeast, Upper Midwest, and Texas. Berkadia’s senior housing team completed more than $1.7 billion in loan volume last year alone. HUD lender Love Funding has welcomed Brent Frank as its newest senior director of originations. Frank, who will be based in Chicago, previously worked at Love Funding’s parent company, Midland States Bank. There, he specialized in commercial real estate, with a focus on bridge-to-HUD program lending. He also previously was executive vice president and senior lender at GreatBanc. In total, Frank brings to Love Funding more than 30 years of securing HUD-insured financing for multifamily properties and healthcare facilities. Commercial real estate services and finance company Walker & Dunlop has hired Michael Davis as senior vice president in its FHA Finance group. In his new role, Davis will originate loans through the U.S. Department of Housing and Urban Development (HUD), Fannie Mae, and Freddie Mac, with a focus on senior housing and health care finance. Prior to joining the company, Davis was a managing director at Silver Leaf Partners, where he sourced debt and equity for real estate, private equity, and affordable housing acquisition programs. Post-acute, long-term care and senior living consulting and management firm Health Dimensions Group has promoted several employees to its executive leadership team. Leah Lindgren was named executive vice president of marketing, consulting, and revenue cycle. Steve Nelson was named executive vice president of finance. Ann Robinson was named executive vice president of operations and quality. Amber Rogotzke was named to executive vice president of human resources.